Mn–Co-decorated reduced graphene oxide (Mn–Co–rGO) was prepared by modified condensation method and characterized through XRD, SEM, EDX, FTIR and BET surface area analysis. The prepared sample was explored for its activity in the synthesis of N-benzylideneaniline (N-BA) using benzyl alcohol and PhNH2 as precursors. The catalyst has been used efficiently with high activity and selectivity for oxidation of benzyl alcohol to benzaldehyde in the presence of molecular oxygen, which further react with aniline to produced N-BA with sustainable catalytic activity up to five cycles. Furthermore, the effect of the nature and position of the substituent on aniline on the chemical reactivity of the nucleophile was studied theoretically using density functional calculations. 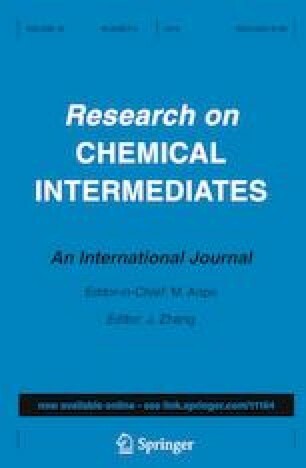 The online version of this article ( https://doi.org/10.1007/s11164-019-03772-w) contains supplementary material, which is available to authorized users.